Lorraine Hansberry was an African American playwright and author of political speeches, letters, and essays. Her best known work, A Raisin in the Sun, was inspired by her family's legal battle against racially segregated housing laws in the Washington Park Subdivision of the South Side of Chicago during her childhood. 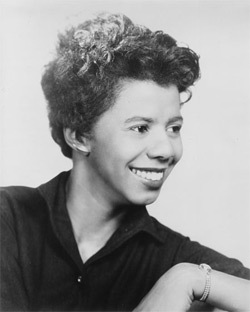 Hansberry attended the University of Wisconsin�Madison, but found college uninspiring and left in 1950 to pursue her career as a writer in New York City, where she attended The New School. She worked on the staff of the black newspaper Freedom under the auspices of Paul Robeson, and worked with W. E. B. DuBois, whose office was in the same building. A Raisin in the Sun was written at this time, and was a huge success. It was the first play written by an African-American woman to be produced on Broadway. At 29 years, she became the youngest American playwright and only the fifth woman to receive the New York Drama Critics Circle Award for Best Play. While many of her other writings were published in her lifetime - essays, articles, and the text for the SNCC book The Movement, the only other play given a contemporary production was The Sign in Sidney Brustein's Window. In 1961, Hansberry was set Vinnette Carroll as the director of the musical, Kicks and Co, after its try-out at Chicago's McCormick Place. It was written by Oscar Brown, Jr. and featured an interracial cast including Lonnie Sattin, Nichelle Nichols, Vi Velasco, Al Freeman, Jr., Zabeth Wilde and Burgess Meredith in the title role of Mr. Kicks. A satire involving miscegenation, the $400,000 production was co-produced by her husband Robert Nemiroff; despite a warm reception in the Windy City, the show never made it to Broadway. The thing that makes you exceptional, if you are at all, is inevitably that which makes you lonely.